Easter Brunch & Easter Egg Hunt at Cooper's Landing Inn & Traveler's Tavern. Join us for our Spring inspired Easter Brunch with an Easter Egg Hunt for the children along the grounds. We will be serving brunch inside our historic 1800's Inn dining rooms and outside under the wisteria trellis. The Easter bunny will even be here!Egg hunts for children 10 and under at 12:00 and 1:30! Bring your Easter basket and get ready for the Easter Bunny!Special Easter Brunch Menu that will delight your senses featuring items like Eggs Benedict, Strawberry Stuffed French Toast, Fresh Ahi Tuna, Escargot in Puff Pastry, Fresh Lobster Tails, and Mint Basil Lamb Chops. We will even have bunny pancakes for the children! Professional motorcycle racing is back on the schedule. VIR is honored to be one of only ten venues across the United States to host a 2019 MotoAmerica Road Racing weekend. The three-day event includes Superbike/Superstock 1000, Supersport and Superstock 600 races. Now in its third season, MotoAmerica is revitalizing motorcycle road racing. The Lake Life Summer Series: LIVE from Clarksville is brought to you by the Mecklenburg County Tourism Office, Clarksville Economic Development Association, and an amazing team of local business owners and citizens. The 6-part concert series will be held on the First Saturday of each month starting June-September in the heart of Downtown Clarksville. Concerts start at times vary. Looking for something to entertain you before the event? Take a walk through Downtown Clarksville and step into one of the many shops this charming town offers to find the perfect keepsake to remember your trip by! All of the locally owned restaurants will be hosting specials before, during, and after the event! The Lake Life Summer Series: LIVE from Clarksville is brought to you by the Clarksville Economic Development Association, Mecklenburg County Tourism Office, and an amazing team of local business owners and citizens. The 4-part concert series will be held on the First Saturday of each month from May-October in the heart of Downtown Clarksville. Concerts 6:00-9:00 pm. Bringing the best of Beach Music to the Lake!!! May: The Tobacco Road Band The Feature Attraction Band The Konnection June: The Catalinas July: Jim Quick & Coastline August: The Chairmen of the Board September: JB and the Get Down Browns The Embers featuring Craig Woolard October: (Beach & Brew Bash-Local & Regional Virginia Breweries) Steve Owens and Summertime What to do? Looking for something to entertain you before and after the events? Take a walk through Downtown Clarksville and step into one of the many shops this charming town offers to find the perfect keepsake to remember your trip by! What to eat and drink? All of our locally owned restaurants will be hosting specials before, during, and after each event! Food from The Cottage Barn and Cooper's Landing Inn, as well as, local and national beers will be for sale at the event! Don't Forget Mom! Mother's Day Brunch at Cooper's Landing Inn & Traveler's Tavern. Brunch 10am - 3pm. We will serve brunch inside our historic Inn from the 1800's as well as outside under the wisteria trellis. Come enjoy house specials like Strawberry French Toast, Eggs Benedict, Hot Crab Dip, Sausage en Croute, The Super Mom Surf and Turf and more! All mom's will be treated to a fresh flower! The Band of Oz was formed in 1967 as a part-time band playing fraternity parties and high school proms all over the South. In 1977 the band went on the road full time. Since that time the band has made an exceptional name for itself throughout the Southeast by playing the top clubs and corporate parties, and getting excellent reviews along the way. For several years the group has been a guest on most of the major beach concerts in the Carolinas, Virginia, and Georgia. The Band of Oz is one of the most successful groups in the Southeast, and continues to get the very best reviews from the top people in the entertainment business. The band now features a full horn section to total a dynamic eight-member group. They still perform well over two-hundred shows per year for corporate events, festivals, concerts, wedding receptions, and many other public and private events. Sunset Sounds #ThirdThursday Concert Series is a collection of great bands presented by South Hill Market Square. The concert series are held every third Thursday of the month from May - September. Bring your lawn chairs, blankets, friends and family and join us for a fantastic night of music, wine, food, and fun! We will be joined by food trucks who will be serving some delicious food! Check back soon for their concert menus! As always, you are also welcome to bring your own picnic as well – just please no outside alcohol as our ABC Permit does not allow for it. As before, we will have Virginia Craft Beers available for purchase for all of you non-wine drinkers! Please note that we will not be giving wine tastings during the concert! Ticket Prices:Adult Ticket – $15Includes concert admission and a souvenir glass.Club Members – $12Includes concert admission and a souvenir glass.Child (5+) or Designated Driver – $10Includes concert admission.Call the Winery at 434-636-9463 or pre-purchase your tickets early online and receive 20% off of Gate prices! Make plans to join us for the 11th Annual Rosemont Wine & Art Festival! This is our biggest event of the year, highlighting over 30 fine artists and exhibitors, adding new talent year after year. You’ll find art of all mediums, including paintings, photography, pottery, jewelry, woodworking and more. As we do every year, we will be raffling off three $100 gift certificates that we will draw in the afternoon to be redeemed at any participating artist’s booth! The drawings will be held at 12:00, 2:00 and 4:00, but you have to visit the artists first, so be sure to come early and see what they have to offer! We hope to see you at the 9th Annual Rosemont Wine & Art Festival! Don't Forget Dad! Special Father's Day Brunch at Cooper's Landing. Bring Dad to Cooper's Landing for Brunch where he can enjoy "manly" specials like Oysters Rockefellar, Eggs Benedict, Buffalo Tenderloin in a Jack Daniels Demi Glace, Surf and Turf, and Banannas Foster cake! We'll have Brunch items the whole family can enjoy with inside seating and outside seating on our trellised patio. Father's Day Brunch will be served from 10am - 3pm. With innovations in safety and affordability, the F3 Americas Championship is designed to attract the very best young talent from around the world. SCCA Pro Racing sanctions this Championship, recognizing the importance of developing the racing stars of tomorrow. The F3 Americas Championship Powered by Honda offers young talent the opportunity to demonstrate their skills on an international platform while keeping affordability and safety as key elements of the program. Having the F3 Americas chassis manufactured in the United States by Onroak Automotive, the Honda Civic Type R motor built in Anna, Ohio, and the Hankook Tires marketed and distributed from Nashville, Tennessee, aids in affordability and availability. With the F4 U.S. Championship exceeding the expectations of its partners and participants, its drivers and teams are seeking the next step in their championship development. After years of discussion, development, testing, and manufacturing, the F3 Americas Championship is ready for launch. The regional FIA series is the fastest way for an aspiring driver to gain experience with an international racing platform at an affordable price. All current military will be admitted free and veterans will receive a 50% discount to ALL VIR events. Children 16 and under are always free with a paying adult and there is no cost for parking. August is once again an exciting month at VIR, as the fan-favorite IMSA Michelin Pilot Challenge makes its only mid-Atlantic stop in the premier North American sports car racing series at the track August 23-25. In addition to the headlining Michelin GT Challenge race, the action-packed weekend will feature several other support series as well as celebrating the 50th Anniversary of IMSA. All current military will be admitted free and veterans will receive a 50% discount on ALL VIR events. Just present a valid Government issued military ID to registration when you arrive. This offer not valid for private track rentals. Children 16 and under are always free with a paying adult and there is no cost for parking. VIRginia International Raceway’s Championship Cup Series Fall CycleFest brings some of the motorcycle road racing’s best teams and riders onto the track. Look for extremely close, side-by-side, knee dragging action as the contenders separate themselves from the pretenders for the coveted season crown! All current military will be admitted free and veterans will receive a 50% discount to ALL VIR events. Children 16 and under are always free with a paying adult and there is no cost for parking. Virginia International Raceway’s circuit is a favorite autumn race destination for SVRA drivers and teams. Some of the best vintage and historic Sports Racing, Formula and Production GT race cars will grace the road course over the weekend. The grids feature many of the best-known, and prestigious marques in racing, including Lotus, Porsche, Shelby, Alfa, Corvette, MG and Jaguar. The American Racing Legends Charity Pro-Am will return, pairing veteran NASCAR drivers with amateur racing partners driving Corvettes, Camaros and Mustangs for a 45-minute race. The Hagerty Show and Shine Car Show will host over one hundred street and performance cars. The Trans-Am Series and Mazda Miata Heritage Cup will join SVRA at VIR as a part of their nationwide series. All current military will be admitted free and veterans will receive a 50% discount to ALL VIR events. Children 16 and under are always free with a paying adult and there is no cost for parking. Bring the family and stay for the day. This festival has something for everyone, young and old alike. Crafters line the streets with handmade items from wreaths, to wooden chairs, to toys and more. Music fills the air from the two stages of live entertainment. And food is available for every taste. Get a turkey leg and lemonade, BBQ and soft drink and don't forget those Cinn-Sational Cinnamon Rolls! The kids will enjoy the face painting, pumpkin painting, scarecrow making, sand art, balloon sculpting clowns, magicians and the bounce houses. 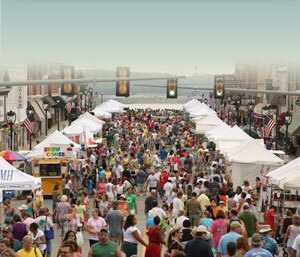 The street festival runs from 9:00 am to 5:00 pm. Don't miss it!!! The morning of Saturday, October 1st, vendors will line the streets along Virginia Avenue offering seasonal crafts, specialty items, antiques, collectibles and antiquities from 9 am to 3 pm. In addition to the vendors, the one-of-a-kind specialty shops and restaurants will offer specials throughout the downtown area, along with a host of games & crafts for the kids. The SCCA’s crown jewel event is the annual “Runoffs” and serves as a gathering for the top SCCA racers in the country to go head-to-head and prove who is best. Throughout its 50+ year history, the Runoffs have been held at legendary tracks including Daytona, Road Atlanta and Road America and in 2017, for the first time the SCCA Runoffs was held at the Indianapolis Motor Speedway. Also a first, the 2018 SCCA Runoffs were held at Sonoma Raceway. The will be held at VIR for 2019! All current military will be admitted free and veterans will receive a 50% discount to ALL VIR events. Children 16 and under are always free with a paying adult and there is no cost for parking. Admission is FREE so bring the entire family! There is no fee to attend – only a $5 tasting fee to enjoy wine for the day – Rosemont souvenir glass included! So bring the entire family and make a great afternoon of celebrating the end of harvest! We’ve got something for everyone, so bring a picnic blanket and the entire family! Grape Stomp Competition @ 2:00 PMCome by early and sign up for the Grape Stomp Competition! It is open to everyone so enter your name into the drawing to participate! Put your name in at 11:00 AM and we will draw names starting at 2:00 pm. Participating contestants will have the chance to win three great prizes! Activities for the Entire Family! We offer a variety of activities that the whole family can participate in – pumpkin painting, bobbing for apples, and we’ll even have a great set up for a family photo opportunity, so be sure to bring your camera! All persons competing in the State Championship must pre-qualify. There are 4 qualifying rounds, All music must be in a Karaoke Format. A panel of judges will score each person on a score sheet. The top five singers will be selected from each of the four age groups for the championship. Once the top 5 singers are selected in each age group, that age group will not be open in the next qualifying round. $20. Person to enter. All proceeds are used for our Warmth for the elderly Christmas program.All songs must be on a Karaoke format, singers will be judged on voice, difficultly of song, stage present & audience response. . This is a Community Charity Event, all funds raised are used to provide a warm & cheerful Christmas for our Elderly in nursing homes or shut-in their homes.. Qualifiers will be divided into four age classe for the Championships . All qualifiers receive an award for competing in the Championship..
Bring your favorite ghouls and goblins to a Halloween celebration at Cooper's landing Inn & Traveler's Tavern. After the kids stroll downtown and visit the thirty plus merchants that hand out goodies and treats walk over to the covered pavilion at Cooper's for a Halloween Party and Buffet for both adults and kids. There will be a costume contest, face painting, and free S'mores by the fire-pit for the kids. Adults can sit back and enjoy the kids having fun while trying our signature Pumpkin Martini or a nice cold fall microbrew. $10 for kids under 10, $20 for adults for buffet and fall fun. Will will still offer our regular dinner menu and have seating both inside and out. We promise a spooktacular event for both kids and gwown-ups! A wonderful family event . . . we have decked the halls. Bring the family for the 14th Annual Brunch with Santa. You can cozy up to our 1830's woodstove or dine next to one of our 14 beautifully decorated Christmas trees. There will be reindeer pancakes, peppermint hot chocolate, and Santa of course! We ask each child to bring a toy to donate for local families in need. Cooper’s Landing will match the number of collected toys and hopefully bring some holiday cheer to those in need. Reservations recommended. Seatings begin at 9 am. Ring in the New Year with a special celebration at Cooper’s Landing Inn & Traveler’s Tavern. There will be two seatings: 5pm & 9pm. Each seating will consist of a passed hors d'oeuvre reception accompanied by music and a roaring fire in the tavern & a three course Surf-n-Turf dinner. Of course the evening will include a champagne toast, candlelight, and all the special touches like New Years Eve Favors. The price is $72 per person. The first seating will be from 5pm-8pm and the second from 9pm until the New Year! Guests of the Inn & the public are invited to make a reservation to ring in the New Year at Cooper's Landing. For those who want to have extra bubbly, enjoy one of our six romantic rooms with fireplaces and jacuzzis for an additional charge of $125 - $200. Cooper's Landing is for Lovers! Dinner Specials. Valentine's is such a wonderful time at Cooper's Landing we do it for 4 nights so you aren't rushed and can beat the crowds on Feb. 14th. Treat your sweetheart to a night of tantalizing dishes . . . the perfect romantic setting for your Valentine! Chateaubriand for Two, Chocolate Covered Strawberries ,Mocha Creme Brule, Long Stem Roses and More. For the True Romantic book a table at Cooper's Landing for our Valentine's Special. We also offer special Bed & Breakfast Valentine's Packages.